Some members want to end this standoff over the debt ceiling—and all others. 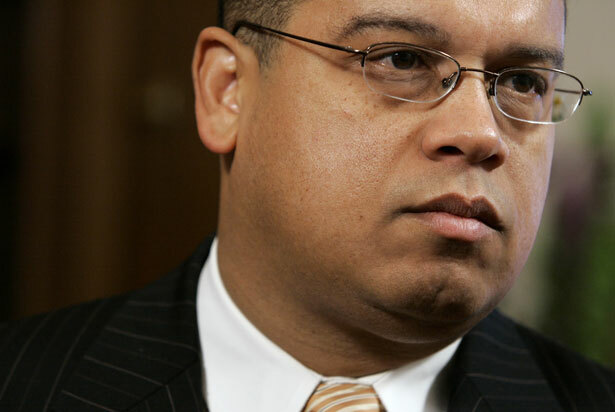 Democratic Representative Keith Ellison and five others are sponsoring the Full Faith and Credit Act. (AP Photo/Haraz N. Ghanbari). As the country barrels towards a possible default on its debt, members of the Congressional Progressive Caucus announced this week that they are introducing legislation to eliminate the federal debt ceiling. Representatives Jerrold Nadler, Hank Johnson, Jim Moran, Jan Schakowsky, Keith Ellison and Peter Welch are co-sponsoring the Full Faith and Credit Act of 2013, which would abolish the anachronistic debt ceiling and prevent future gamesmanship over the Treasury’s ability to pay the country’s bills. The measure was originally introduced in 2011 after the last battle over the debt ceiling resulted in Standard and Poor’s downgrading of the US credit rating for the first time in history. The bill was referred to the House Committee on Ways and Means, but did not go any further in the Republican Congress. As Congress approaches the borrowing limit, which Geithner says will be reached sometime in February or March, they’re giving it another shot. Each representative reiterated the dangerous consequences in store, should Congress fail to extend the debt limit, thereby forfeiting the government's ability to make payments of any kind. One result, which Republican Tom Coburn recently called “a wonderful experiment,” would be a government shutdown. Representative Johnson echoed statements Obama made in a Monday news conference, by listing the sectors of society that would be affected. Social security recipients, troops and veterans, small businesses contracting with the government, and air traffic controllers are among the many that would see immediate reductions, or even discontinuation of their paychecks. The government would also be unable to pay its creditors, which would lead to the graver consequence: a default on the national debt. Defaulting would surely result in a further downgrade of the American credit rating and an increase in interest rates that would have major ramifications in the world economy. Historically, raising the debt ceiling has been a mere formality. It was established in 1939, based on amendments to the Second Liberty Bond Act of 1917, in order to consolidate federal debts and allow the US Treasury more flexibility to reduce interest costs. The debt limit does not dictate how Congress decides to spend money; rather, Congress votes on spending and then increases the debt ceiling as necessary. Since its inception, Congress has raised the debt ceiling as a matter of routine at least once during almost every administration. By refusing to vote for a debt limit increase unless Democrats agree to major spending cuts, Republicans are rhetorically linking the two issues, creating the implication that increasing the debt ceiling is an example of big-government Democrats wanting to borrow more money to do more spending. Newt Gingrich, interviewed yesterday on CBS This Morning, called Republicans’ position on the debt ceiling “a threat they can’t sustain.” Even Americans for Prosperity, a conservative lobbying group backed by the Koch brothers, has weighed in, advising Republican leaders to focus on the issue of sequestration instead.